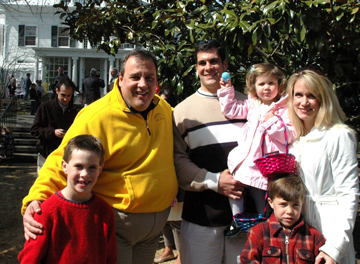 THE EGG AND I: Saturday was Governor Chris Christies first time presiding over the annual Easter egg hunt at Drumthwacket, an event hes enjoying here in the company of the Cartnick family (in front, from left) brothers Thomas and Christopher; (behind, from left) Mr. Christie; Tom, who is holding Julia, with her egg and her basket; and Marian. The Princeton Board of Education capped a lengthy discussion last Thursday by unanimously passing a proposed school budget that will have a tax impact of 3.9 percent on Township and Borough residents. The main meeting room was packed with firefighters, supporters, and other interested parties for last weeks Borough Council discussion about the status of the repairs at Engine Company Number One. The governing body unanimously approved proceeding with floor repairs at the Chestnut Street firehouse and engaging in a study of the entire Princeton Fire Department vis-à-vis its spatial, equipment, and staffing needs. The structure of the Borough Police Department is up for consideration by Council, which voted 5-1 at its last meeting to introduce an ordinance which would reduce the maximum number of police officers in the department from 34 to 30, and reinstate the position of captain within the force. There will be a public reconvening to discuss the future of the Community Park Pool complex on Wednesday, April 7, at 7 p.m. in the main meeting room at Township Hall. While N.J. school districts bemoan recent state cuts to their budgets, there is a movement afoot claiming that more money is not necessarily the key to successful schools. “Start again!” exclaimed members of the poetry-loving audience after a raucous cell phone interrupted Ruth Ramsey’s reading of her poem “In Baja” at the Sunday book launch of the latest issue of U.S. 1 Worksheets. Peter Stanton has been coaching high school lacrosse long enough to know that a programs fortunes goes in cycles, with down years leading to big seasons. Imagine being falsely accused. Then imagine being imprisoned for many years or even for your entire life, based on that false testimony. An unthinkable nightmare for most of us, but one all too familiar to James McCloskey, whose life’s work has been dedicated to establishing the innocence of and ultimately freeing unjustly incarcerated individuals.